My conference project draws inspiration from several sources. From animated films such as Hiyao Miyazaki’s Castle in the Sky to video games like Valve’s Portal 2, fictional media has often explored the relationship between nature and technology within futuristic, post-apocalyptic fantasy worlds. Overgrown weeds and mold attempt to retake the remains of long-abandoned high-tech societies. I’m not sure quite why I’m particularly drawn to this theme, but I find that it serves as both a central aesthetic and plot element in many of my favorite films and video games. The visual contrast between raw, colorful nature and silver steel is striking. For my conference project, I wanted to channel this type of imagery in an animation to accompany an original piece of my music. Before I began animating or even had my vision for what would become the visual content of this piece, I composed and produced the music. In creating this track, I experimented with a variety of musical styles such as breakcore, idm, and trap. Due to its constantly and drastically evolving song structure, this piece works well as the score to an animation. As I have done with past visual accompaniments to my music, I tried to change and introduce visual elements in sync with changes in the music. In this post-mortem, I will discuss some of the ways I channeled my inspirations into this piece, as well as the technical processes I used to create these effects. Due to the length and complexity of the piece, I am unable to discuss every aspect of the animation and the creative process behind it. I have thus chosen to discuss only the elements I found most challenging and interesting. The black “liquid metal” layer in the forefront of this still is one element of my animation that draws influence from the technological in this dichotomy. The process of creating this effect required much experimentation, but was ultimately one of the most personally satisfying parts of this whole project. 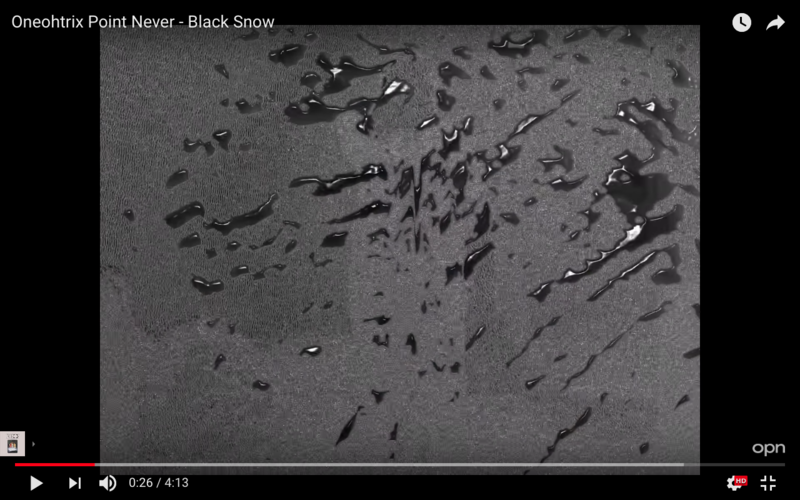 My initial goal was to create a moving “liquid metal” overlay effect similar to that used in experimental electronic musician Oneohtrix Point Never’s recent music video Black Snow. Upon seeing that video, my first thought was of the liquid metal effect used for the T-1000 in the 1991 film Terminator 2: Judgement Day. To achieve this effect, I loosely followed instructions from youtube tutorial videos, supplementing with my own experimentation. First, I created a composition with a transparent background layer. 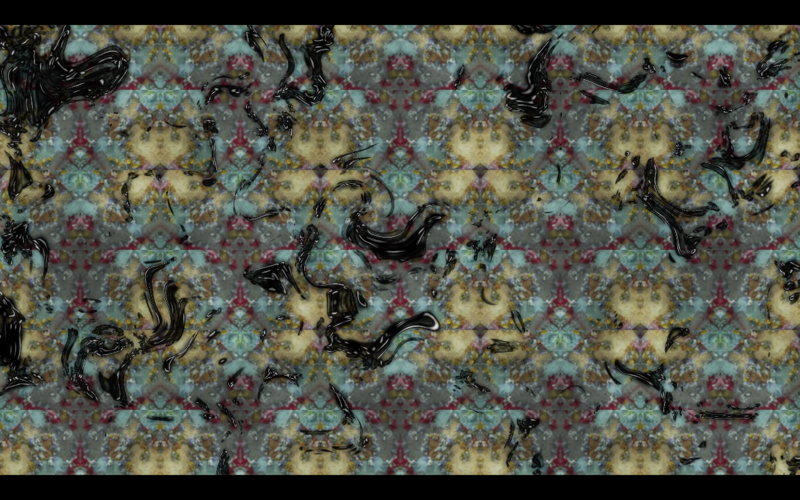 I then created a black solid with the Fractal Noise effect. On this instance of Fractal Noise, I used the “dynamic twist” fractal type and the “soft linear” noise type, with a very high (325) contrast and a very low (-101) brightness. I then applied the Find Edges effect, with “invert” on. To create movement, I used the Turbulent Displace effect, and keyframed the evolution. At this point, I had achieved the liquid metal effect, but because it was applied to a black solid, the background was black. To make this effect applicable as an overlay, I used unmult, an effect which turns specific colors transparent. 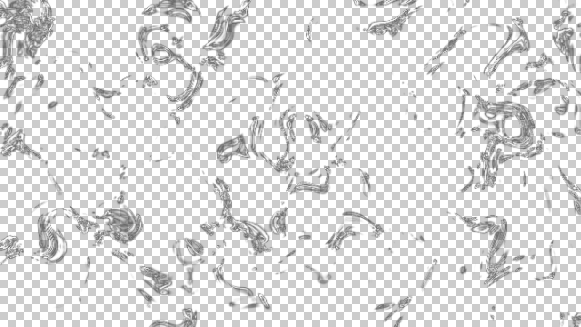 I set this effect to make the black solid transparent, thus creating a liquid metal overlay with a transparent background that could be applied over my animation. To create the liquid metal sphere that appears at 00:11, I followed essentially the same process, but applied the cc sphere effect. 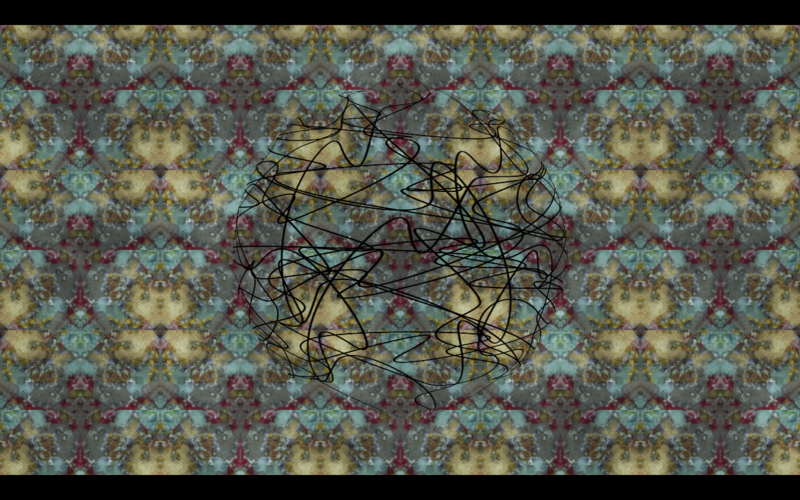 The second sphere in my animation, which consists of moving lines, was also creating using this effect. To create this element, I created a composition with a shape layer. In this layer, I drew a vector shape using the pen tool. I then applied the wiggle transform, stroke, gradient fill, and repeater animation tools to this vector shape. Finally, I applied the cc sphere effect to the shape to give it its form. The following is a screenshot of this element. In conclusion, I’m very proud of the work I accomplished with this project. I successfully executed my goal of creating a visual accompaniment to a piece of my music; one which channels the dichotomy between technology and nature through the replication of visual elements from several sources of inspiration. Not only did I successfully execute this goal, my creative process taught me new skills in after effects. Through the process of creating this piece I learned how to create transparent solids using unmult, create liquid metal elements using fractal noise, and turn vector shapes into spheres using the cc sphere effect.